I'm a tad late getting my Sunday Stamps card up but here it is! 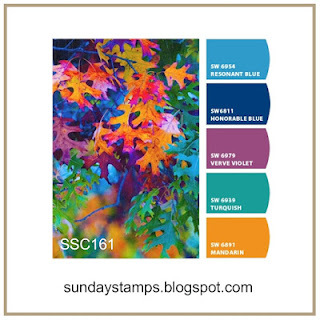 This week at Sunday Stamps we have a color challenge, some nice bright colors that are perfect for autumn themed cards. I used a sentiment stamp from SugarPea Designs as my focal point and stamped it in the purple from the challenge. I brought in the orange and turquoise (I used a more muted shade) with my background papers and the leaves. Make sure you head on over to the Sunday Stamps blog to see what the rest of the DT created and then play along with us!